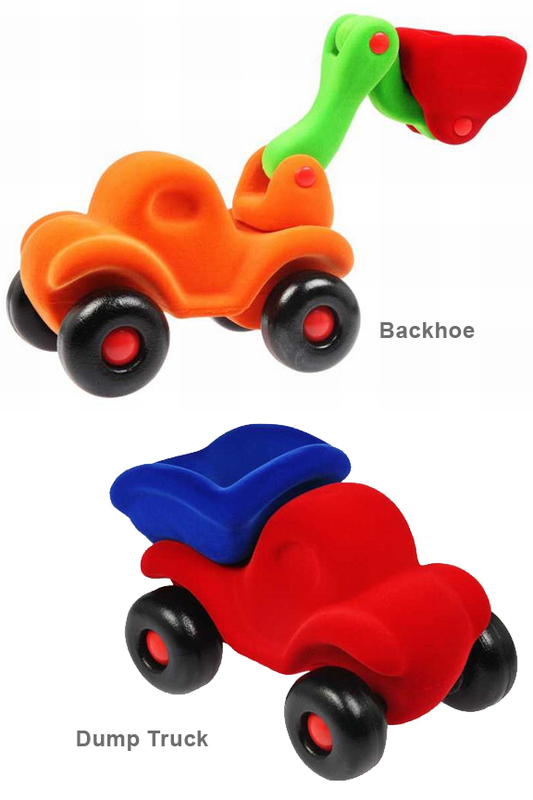 Soft and Squishy Toy Trucks With Moveable Parts. Stuff Points: Earn 23 points when you buy this stuff. One of the best toys available just got a little better. The addition of moving parts set these Rubbabu Trucks apart from the other lines, and really adds something special. Now, boys and girls of all ages will be able to dig, fift, dump and more with their Rubbabu Truck. With even more possibilities for fun and education these deluxe model trucks will keep them busy for years to come. They are large in size, feature bright bold colors, and are soft and squishy to the touch. Little hands can easily grasp and play with these oversized vehicles. The Rubbabu line of toys is one that you have to feel to truly appreciate. Choose from the Backhoe, Dump Truck, or Fire Engine. With three different trucks to choose from, you're sure to find the perfect choice for any child. Bully Bulldozer - With a digger bucket that really scoops! Cleanupper Dump Truck - With a large truck bed that really dumps! Fireman Rubba Engine - With a large ladder that goes up and down! Rubbabu toys are soft and squishy to the touch, yet sturdy enough to handle years of abuse. The exterior of the trucks are covered in a safe, non-toxic flocking that makes them feel silky smooth to the touch. Your child won't want to put it down, guaranteeing hours of tactile amusement. The Rubbabu Action Trucks come in your choice of three different styles, so you are sure to find one perfect for your child. They are specifically designed to stimulate the senses and facilitate development of fine motor skills and hand eye coordination. Safe and natural materials ensure a high quality toy that children will play with for years to come. Bright colors, soft texture, and squishy bodies make these cars truly unique. They are large in size making them perfect for smaller children too. 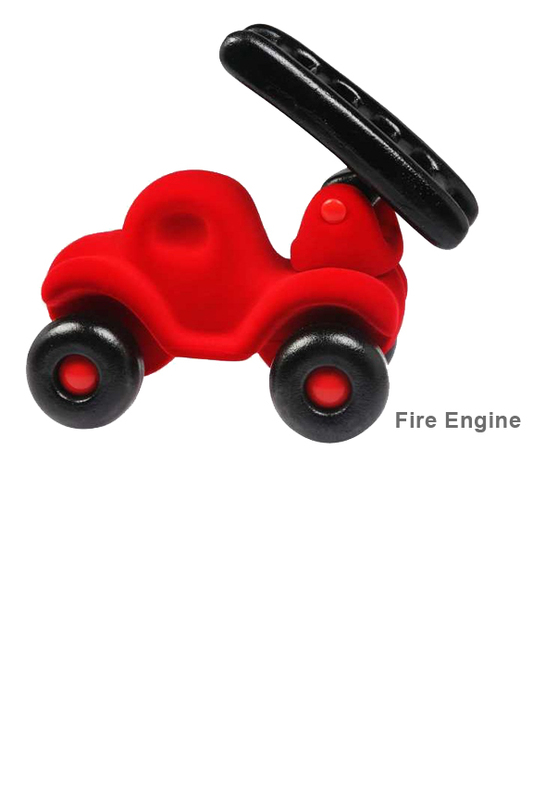 The large body and soft wheels are easy for small hands to grasp. Kids love to roll these cars all over. When tossed, they just bounce and keep going! These squishy trucks will take a large amount of abuse, and are designed to last for years. Your children will have a ball while strengthening motor skills and coordination. No batteries or remotes involved. Made from natural rubber. 100% biodegradable and tested safe. Rubbabu is made with natural rubber instead of the synthetic stuff used by other manufacturers. It comes from the sap of the tree, so nothing is cut down or destroyed to extract it, and the material is completely renewable. Other rubber products will contain fillers that lower the quality and make the rubber less sturdy. With Rubbabu, there are never any fillers, so you get a stronger, more durable rubber toy that will last for a long time. Another benefit beyond flexibility and strength is that this natural rubber is anti-microbial, dust mite resistant, mildew resistant, hypoallergenic and flame retardant. You can feel good about purchasing a toy made from renewable resources, and even better knowing that your children will be safe when they play with it. With Rubbabu even the manufacturing process is eco-friendly because only a very small amount of electricity is needed to produce each one. Order Yours Today! Dimensions 9" x 5" x 6"
Uses Roll them around, bounce them off jumps, squeeze them while crawling, your kids will find all sorts of ways to play with these versatile vehicles. WIth the addition of moving parts, your kids will be able to raise the ladder to save the day, lift the bed to dump a load of dirt, or use the scoop to dig the deepest whole ever. The soft exterior and squish-ability keep kids coming back for more. 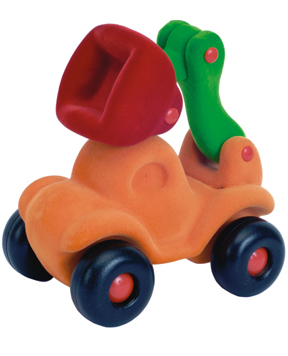 Great moveable toy trucks made from rubber. No batteries, plugs or remotes. Just plain fun! Rubbabu Action Trucks are a favorite of boys and girls alike. Order Yours Today! A Small Dusting Tool For All Those Little Jobs. Attract Dust Like a Magnet. A Large Sand Toy For Drilling Holes. What it Wants, It Grabs! It Can't Be Reasoned With. A Universal Handle To Make Pushing Comfortable & Convenient. A No Spill Snack Container for Kids! Size 6-12 Months. Fun Foot Covers For Your Baby! Size 6-12 Months. Prehistoric Rivals That Also Keep Feet Warm And Comfy!